Post WW I growth in the Ocean Springs community, a spillover of the Florida land boom of the 1920s, dictated that a new public school be erected in 1926-1927. Land for the building on Government Street, at the time a part of US Highway 90, the Old Spanish Trail, was donated by Daniel J. Gay (1870-1949), a local entrepreneur in naval stores, banking, and real estate. Mr. Gay’s three granddaughters graduated from the school in the 1940s and 1950s. Charles T. Nolan, an architect from New Orleans, designed the new public school for Ocean Springs, in Jacobethan-English Renaissance style. The design is typical of the buildings of this era having ornamental castings and parapet copings in load bearing masonry. This structure is a two-story, T-shaped, flat-roofed, masonry building of approximately 20,600 square-feet. The low bid for the construction of the edifice, which cost approximately $80,000, was submitted by general contractor, Berry & Applewhite of Columbia, Mississippi. Local craftsmen who labored on the school building were plumber, Charles E. Engbarth (1885-1962) and Jack Shilling, a plasterer. Some building materials for the 1927 Ocean Springs Public School were vended by J. O’Keefe and A.P. Moran (1897-1967) of The Ocean Springs Lumber Company. During the Depression Era, two WPA art commissions for the 1927 Ocean Springs Public School were granted to local artists, Walter I. Anderson (1903-1965) and his brother, James McConnell Anderson (1907-1998). They respectively created two artistic scenes, “Ocean Springs: Past and Present”, a six panel oil on canvas, and “The Fish and Bird Mural”, a tile mural constructed in four sections. Both works of art are extant, although Walter I. Anderson’s paintings were removed from the school’s auditorium in 1989, and placed in the Walter Anderson Museum of Art in 1991, were they hang permanently. In May 1965, the last senior class of the 1927 Ocean Springs Public School graduated. The high school population moved to its new plant on Holcomb Boulevard. The Ocean Springs School District Superintendent and his staff have occupied the old public school building since 1974. In 1987, the 1927 Ocean Springs Public school was placed on the National Register of Historic Places. This designation came when five historic districts of Ocean Springs were accepted by the Mississippi Department of Archives & History. By 1998, the building had began to demolish by neglect to the extent that it was designated as one of “the ten most endangered historic buildings in the State” by the Mississippi Heritage Trust. The Friends of the Mary C. O’Keefe Cultural Center of Arts and Education was formed in February 1999, from alumni and concerned citizens to preserve the structure by raising funds to refurbish it. On October 9, 1999, the building was dedicated as The Mary C. O’Keefe Cultural Center of Arts and Education by the City of Ocean Springs. Miss Mary C. O’Keefe (1893-1980) was School Superintendent of Ocean Springs Public Schools from 1929 until her retirement in 1945. In this capacity, she was the first woman in the State to achieve this status. During her tenure as School Superintendent, she instilled in the community the value of education, and raised the level of learning in the public schools to a higher level. A preliminary estimate for a complete refurbishment of the 1927 Ocean Springs Public School is $3,174,000. This cost is summarized as follows: Exterior repair-$312,000; Auditorium-$450,000; Roof $150,000; Interior remodeling-$1,612,400; Mechanical-$250,000; Electrical- $275,000; and Plumbing-$125,000. After decades of demolition by neglect, one of this city's most venerable landmarks is receiving the attention and long overdue respect. Thanks to a loyal alumni core and the support of the Mayor and Board of Aldermen, there is finally an attempt to preserve the 1927 Ocean Springs Public School, which has been called in recent times the School Administration Building. It currently houses the administrative offices of the Ocean Springs Municipal School District. In November 1998, the Mississippi Heritage Trust recognized this building as being one of "Mississippi's 10 Most Endangered Historic Places". Its image will be in the traveling portfolio of photographs of the other at risk Mississippi structures that will be exhibited across the State and in Washington D.C. The aim of the traveling exhibit is to focus attention on the diverse architectural heritage of Mississippi and for people to be aware of the need to preserve our architectural treasures. (The Mississippi Press, November 29, 1998, p. 8-A) Funds from the City treasury as well as the O'Keefe Foundation are providing the finances to arrest the slow destruction of this hallowed structure. With more community interest and the influx of money, it appears that it is only a matter of time, before a complete restoration of the edifice will be accomplished. Fund raising committees have been formed thusly initiating the process of acquiring capital for improvements to the seventy-two year old, former educational facility. Daniel Judson Gay was born in Emmanuel County, Georgia. In 1902, he found his way to the Mississippi Gulf Coast via the turpentine industry from Florida. Mr. Gay settled at Biloxi and made his livelihood in banking, real estate, and naval stores production. He also taught school. (The Ocean Springs Record, May 28, 1998, p. 20) His son, John Champlin "Champ"Gay (1909-1975), resided at Ocean Springs where he was active in the business community making his livelihood in naval stores, retail hardware, banking, and real estate. Champ Gay was elected Mayor of this city for three terms (1953-1961 and 1965-1969). (The Ocean Springs Record, June 29, 1995, p. 20) The three daughters, Gloria G. Hobgood, Estelle G. Williams, and Jonne G. Pollina, of Mayor Gay and his wife, Jennie Tucker Heiss "Tuck" Gay (1909-1996), are graduates of the 1927 Ocean Springs High School. They finished the institution in 1947, 1949, and 1957 respectively. Who else to instill in the local populace the importance of education than a native daughter, Miss Mary C. O'Keefe (1893-1980), who was born on the northeast corner of Porter and Jackson in 1893. Her grandfather, Edward O'Keefe (1815-1874), an Irish immigrant, settled at Ocean Springs in the late 1850s. Miss O'Keefe attended local elementary schools and was a 1913 graduate of Newcomb College at New Orleans. In the pursuit of knowledge and her love for travel, she took additional courses during the summer months at the University of Chicago, Columbia University (1925 and 1929), and the Sorbonne (1924) in Paris. Before returning to Ocean Springs in 1927 to teach English, Miss O'Keefe had lectured in French and English at high schools in Shreveport and Monroe, Louisiana and at Biloxi. Mary C. O'Keefe was elected Superintendent of Education at Ocean Springs in 1929, the first woman in Mississippi to be honored. Her charge was the elementary, high school, and Black schools of the local public school system. In this capacity, Miss O'Keefe was able to awaken the community to her philosophy that education was the key to a better life. She was also able to raise the academic standards of the public school system to higher accreditation levels. Although the Great Depression of the 1930s wrought economic woes upon the citizenry of America, the New Deal programs of President Franklin D. Roosevelt (1882-1945) promoted work for the masses and gave hope for better times. One of the positive effects upon the Ocean Springs Public School were two Public Works of Art commissions granted to Walter Inglis "Bob" Anderson (1903-1965) and his brothers, Peter Anderson (1901-1984) and James McConnell "Mac" Anderson (1907-1998). Also at this time, the 1927 Ocean Springs High School received additions. They consisted of a two-story, masonry and wood gymnasium (now called the Taconi Elementary Gym), shop building-band room, and new cafeteria. In addition, a one-story masonry and wood school building for the Black community was erected. (The Gulf Coast Times, January 31, 1952, p. 1) The Colored School was later named for Elizabeth Smith Keys (1892-1976), a long time community educator. Years of neglect, especially that of the roof, has caused major damage to this old structure. It appears that neither the School Board nor City of Ocean Springs took responsibility for the general maintenance of the building since classroom instruction was suspended in 1973. In recent years, efforts of local citizens led by Elizabeth Lemon Roberts, who with other former students of their venerable school had appreciated Miss Mary C. O'Keefe's leadership and guidance while obtaining a fine education, began lobbying for the preservation of their former school building. They also wished the old educational facility to be named for Miss O'Keefe. Mrs. Roberts circulated a petition espousing this and collected over a thousand signatures from the community. 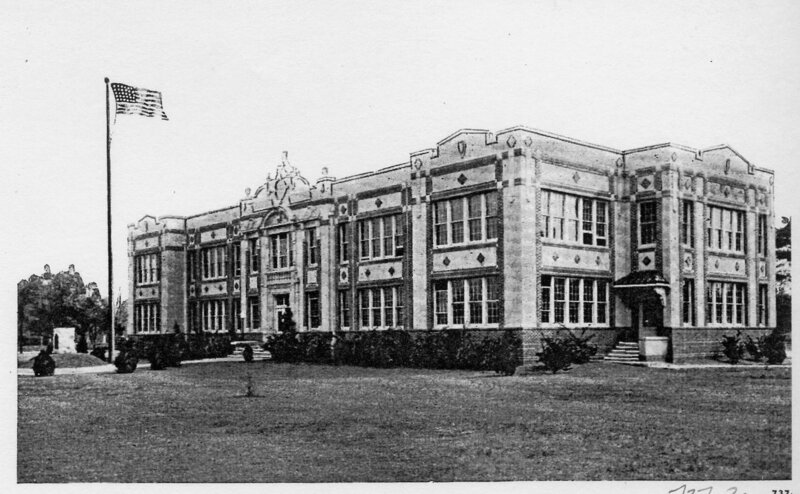 Also at this time, the 1927 Ocean Springs High School received additions. They consisted of a two-story, masonry and wood gymnasium (now called the Taconi Elementary Gym), shop building-band room, and new cafeteria. In addition, a one-story masonry and wood school building for the Black community was erected. (The Gulf Coast Times, January 31, 1952, p. 1) The Colored School was later named for Elizabeth Smith Keys (1892-1976), a long time community educator. In 1993, fund raising began to renew the Taconi Elementary Gym. It was refurbished in 1995 with community raised funds. In recent years, efforts of former students of the 1927 school, led informally and spiritually by Elizabeth Lemon Roberts, who with classmates of her generation, that had appreciated Miss Mary C. O'Keefe's leadership and guidance while obtaining a fine education, began lobbying for the preservation of their old school building. They also wished their venerable educational facility to be named for Miss O'Keefe. Mrs. Roberts circulated a petition espousing this and collected over one thousand signatures from the community supporting the O’Keefe nomenclature. Life members ($1000): Dr. Thomas Handy and Jane Handy, spouse; Eula Webb Switzer; and Mr. and Mrs. Jeff O’Keefe. Held at the Ocean Springs Civic Center on April 5, 2002. Music by Gerald O’Neil and The Today Band. Elizabeth L. Roberts and J.K. Lemon, Ocean Springs: The way we were, 1900-1950, (Ocean Springs Rotary Club: Ocean Springs, Mississippi-1996). Charles E. Schmidt, Ocean Springs French Beachhead, (Lewis Printing Services: Pascagoula, Mississippi-1972). City of Ocean Springs Historic Resources Survey-Update, (Kemp Associates, Ltd.: Meridian, Mississippi-1996). The Walter Anderson Museum of Art, Walter Inglis Anderson, (Dolphin Press: Long Beach, Mississippi-1991). The Walter Anderson Museum of Art, James McConnell Anderson, a retrospective exhibition, (Gulf Printing & Advertising: Ocean Springs, Mississippi-1992). The Bay Press, “New central office connects past to present”, March 29, 2002. The Bay Press, “Mary C. O’Keefe Cultural Center to open Sept. 5”, July 25, 2003. The Bay Press, “Featured artist: Candace du Plessis”, August 22, 2003. The Daily Herald, “Will Rush Work On New School”, July 5, 1912. The Daily Herald, "Body of Soldier Arrives Home", September 17, 1921. The Daily Herald, “Ocean Springs”, June 6, 1923. The Daily Herald, “Ocean Springs”, July 1, 1926. The Daily Herald, “Ocean Springs School Bids”, July 30, 1926. The Daily Herald, “Ocean Springs”, May 9, 1927. The Daily Herald, "Dedicate Ocean Springs School", August 18, 1927. The Daily Herald, "School nears completion", August 18, 1927. The Daily Herald, "Ocean Springs", August 25, 1927. The Daily Herald, "Dedicate Ocean Springs School", September 17, 1927. The Daily Herald, “Fatal fall From Window”, January 2, 1928. The Daily Herald, “Ocean Springs to Have Chautauqua”, April 6, 1928. The Daily Herald, “Ocean Springs”, February 21, 1933. The Daily Herald, “Coast Artists Are Painting Scenes For PWA Art project”, February 2, 1934. The Daily Herald, “School At Ocean Springs Begins Term; Gain In Enrollment”, September 10, 1937. The Daily Herald, “Plans For Ocean Springs School”, October 20, 1949. The Daily Herald, "Ocean Springs", September 9, 1952. The Daily Herald, "Educator Taken By Death", March 9, 1971. The Gulf Coast Times, "New School Bids Asked: Building Ready September", January 31, 1952. The Gulf Coast Times, “Architects Drawing of New Ocean Springs School Buildings", February 28,1952. The Gulf Coast Times, "Name Successful School Bidders: ready For Sept.", March 13, 1952. The Gulf Coast Times, "Will Occupy New School This Week", January 8, 1953. The Jackson County Times, “More Endorsements of School Bond Issue”, September 29, 1923. The Jackson County Times, “W.H. Lewis Opposes Bond Issue”, September 29, 1923. The Jackson County Times, “Local and Personal”, October 6, 1923. The Jackson County Times, “Many bidders seek Ocean Springs bonds", December 26, 1925, p. 3. The Jackson County Times, “A School Building Is The Need Of Negroes Of Ocean Springs”, January 16, 1926. The Jackson County Times, “Proceedings of the Board of Aldermen”, May 29, 1926. The Jackson County Times, "Citizen Opposes Changing School Site", August 7, 1926. The Jackson County Times, "Local Plumber Gets School Plumbing Contract", January 15, 1927. The Jackson County Times, "Local and Personal", February 5, 1927. The Jackson County Times, "Proceedings of the Board of Alderman", May 14, 1927. The Jackson County Times, "Local and Personal", June 4, 1927. The Jackson County Times, "Local and Personal", June 18, 1927. The Jackson County Times, "Local and Personal", September 4, 1927. The Jackson County Times, "Early School Days Recalled", September 10, 1927. The Jackson County Times, "New School Building is One of Mississippi' s Finest", September 10, 1927. The Jackson County Times, "School Faculty Largest Ever", September 10, 1927. The Jackson County Times, "Ocean Springs Football Squad Holds Bay St. Louis", October 1, 1927. The Jackson County Times, "Ocean Springs 12, Biloxi 12", October 8, 1927. The Jackson County Times, "School Notes", October 15, 1927. The Jackson County Times, "Football Team Wins Game At Pascagoula", October 29, 1927. The Jackson County Times, "Local and Personal", November 5, 1917. The Jackson County Times, “Large Crowd Attends Unveiling Of Memorial”, November 12, 1927. The Jackson County Times, “Beautify School Grounds With Plants and Shrubbery”, March 3, 1928. The Jackson County Times, “Ocean Springs Wins Third Place In Literary Meet”, April 28, 1928. The Jackson County Times, "Public School Pupils Receive Gold Medals", May 26, 1928. The Jackson County Times, "Graduation Of Five Ends High School Term", June 2, 1928. The Jackson County Times, “Local Artist Highly Praised By Officials”, June 9, 1934. The Jackson County Times, “Miss Mary C. O’Keefe School Superintendent Honored By Fraternity”, March 30, 1940. The Jackson County Times, “O.S.H.S. Over The Top With Three Army Jeeps”, April 10, 1943. The Jackson County Times, “S.S. Wall Elected Superintendent of Local Public Schools”, July 28, 1945. The Jackson County Times, “S.S. Wall resigns; Coach Clay Boyd appointed Supt. for remainder of term”, April 7, 1950. The Mississippi Press, "Sissy Anderson earns place in local history", March 8, 1991. The Mississippi Press, "Springs building added to endangered list", November 29, 1998. The Mississippi Press, "Heritage Trust working to save historic buildings", April 9, 1999. The Mississippi Press, “Arts Center work moves ahead”, February 20, 2001. The Mississippi Press-Ocean Springs Press”, “Renovate the building –eat chocolate”, April 25, 2001. The Mississippi Press, “Springs aldermen OK $350,000 for O’Keefe center”, March 13, 2002. The Mississippi Press, “Center Stage”, September 3, 2003, p. 1-A. The Mississippi Press, “O'Keefe group seeks funding”, August 30, 2004 p. 1-A. The Ocean Springs News, “Near One-Half Million School Construction To Be Dedicated In Two Ceremonies Saturday”, August 20, 1959. The Ocean Springs News, “Desegregation Plan”, August 12, 1965, p. 3. The Ocean Springs News, "New Facility to be Shown to Public This Sunday", August 19, 1965. The Ocean Springs News, “Four Thousand Attend Open House at New High School”, August 26, 1965. The Ocean Springs Record, “Three Teachers to Retire”, May 21, 1970. The Ocean Springs Record, “1.5 million dollar bond issue Saturday”, December 3, 1970. The Ocean Springs Record, "Supt. Taconi funeral today", March 11, 1971. The Ocean Springs Record, "School Board Views Facilities", August 26, 1971. The Ocean Springs Record, "School Board Accepts New JH", November 21, 1974. The Ocean Springs Record, “Mary C. O’Keefe”, January 24, 1980. The Ocean Springs Record, "Alumni Keep Spirit Alive", November 1, 1984. The Ocean Springs Record, “Historic Old High School May Be Restored”, September 22, 1988. The Ocean Springs Record, “Plans Begin to Restore Old High School”, January 5, 1989. The Ocean Springs Record, Landmark Named”, April 13, 1989. The Ocean Springs Record, “Aldermen agree to expand current library building”, October 1, 1992. The Ocean Springs Record, “City-wide flea market raises funds for Taconi Gym”, March 18, 1993. The Ocean Springs Record, “Taconi Project continues”, May 20, 1993. The Ocean Springs Record, "Sous Les Chenes", June 29, 1995. The Ocean Springs Record, "Sous Les Chenes", May 28, 1998. The Ocean Springs Record, "Old high school named to most endangered list", April 15, 1999. The Ocean Springs Record-Independent, “Old high school might make grade”, January 11, 2001. The Ocean Springs Record, Aldermen add $300K to O’Keefe center fund”, March 14, 2002. The Ocean Springs Record, “O’Keefe project to start”, April 4, 2002. The Ocean Springs Record, “O’Keefe project takes shape”, June 6, 2002. The Ocean Springs Record, “O’Keefe work on schedule”, July 18, 2002. The Ocean Springs Record, “du Plessis named to run O’Keefe center”, July 31, 2003. The Ocean Springs Record, “O’Keefe center opening set”, July 31, 2003. The Ocean Springs Record, “O’Keefe project gets blessing”, August 8, 2002. The Ocean Springs Record, “O’Keefe center to open”, September 4, 2003. The Ocean Springs Record, “Ladner Plaque", October 21, 2004. The Sun Herald, “Workers to remove asbestos from building”, July 26, 1999. The Sun Herald, “O.S. gives cultural center OK”, January 6, 2002. The Sun Herald, “Spadework”, July 28, 2002, p. H-1. The Sun Herald, “Pro repertory Company ready to return to Coast”, July 28, 2002, p. H-1. The Sun Herald, “O.S. arts center plans groundbreaking ceremony”, August 5, 2002, p. A-6. The Sun Herald, “Ocean Springs defies endangered status”, August 6, 2002, p. C-2. The Sun Herald, “Mary O’Keefe center opens doors, August 31, 2003, p. H-1. Ted Bechtel, April 21, 1999. Carl Germany, April 22, 1999. Larry Cosper, April 22, 1999. Arlene White, April 29, 1999.